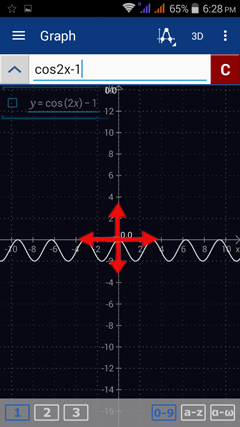 The default x- and y-axes have coordinates displayed in standard form with a fixed 1-unit scale. 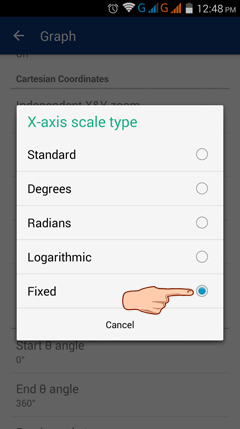 To set the fixed unit scale for the x-axis, tap the menu button then go to Settings > Graph, X-axis scale type > Fixed. To set the scale to a constant value, tap X-axis fixed scale (next to x-axis scale type) and type the preferred scale (e.g. 10, 100, 500, 1000). Then tap OK. The scale options for the y-axis are located just below the x-axis scale type and fixed scale. 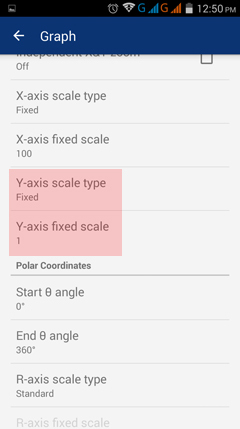 To change the scale for the y-axis, tap Y-axis scale type to select a Fixed scale. Then use Y-axis fixed scale to set the desired scale. 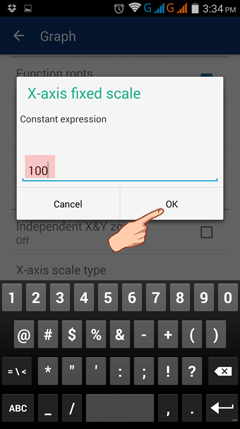 Tap OK.
To use the same scale for both the x- and y-axes, pinch and swipe the graph window either in or out (vertically or horizontally) to change the scales displayed on the screen. Do this until you find your desired scales. Foreign Men Seek Filipina Ladies for Dating and Chat. Join Free Now!